Did your narcissistic partner discard you or break up with you at the worst possible time? It could be that you just learned you have a serious illness (perhaps being hospitalized) or lost someone close to you, only to have your partner act cold and aloof? One of the most heartbreaking stories I hear from clients and followers is how their narcissistic partner discarded them at the worst possible time1. This might include the loss of a job, failing an important exam, following the victim’s diagnosis of a life-threatening illness, or the death of someone close to them (which sometimes includes a child). Other times, the narcissist plans a devastating discard during what should be a joyous occasion, such as their anniversary, right before a long-planned vacation, or even when the victim finds out they’re expecting a baby…with the narcissist! While you’re left to pick up the pieces of your shattered heart during important milestones of your life, the narcissist carries on with business as usual as though your history together means nothing. To you, the horrific discard seems intensely personal, cruel, and callous. But, as devastating as it is, the truth is almost all narcissists discard their partners during important life events, special occasions, and devastating losses. It’s one of their blueprint manipulations. When the narcissist decides it’s time to discard you, nothing is sacred. While you’re waiting for the ‘real, loving and romantic’ person that you thought they were to surface again and show a shred of compassion or basic interest in your situation, the narcissist couldn’t care less as they go about love bombing their new partner right under your nose. Narcissists take pleasure in executing devastating discards at the worst possible times, and there’s a reason behind why they enjoy it so much. In fact, they are acutely aware of what they are doing, and it has absolutely nothing to do with you as an individual. It doesn’t matter whether the narcissist discards you during a joyous occasion or during a devastating loss, their actions and motivations following either event are almost identical. The real aim behind these torturous, soul-shattering discards is that the narcissist is bent on triggering your abandonment wounds and deepening your declining self-esteem…which means they can likely keep you in the queue for as long as they deem you useful. Often, what appears to be a discard is simply a tactic used by almost all narcissists who are no longer in the love bombing phase with a primary supply source. They are in heightened manipulation mode – using your weak spots against you in order to control you and have the upper hand. The reason they strategically implement discards during important life events is so that you will never forget them or what they did to you. In other words, when it comes to your memory bank, instead of recalling your child’s graduation, the warm accolades from your friends and family for your promotion, or the joy of being pregnant with a human life, what you’ll remember instead is the narcissist and their horrific abuse. Following are two tactics narcissists use which look like a discard, but are really hidden ploys to keep you strung along indefinitely. 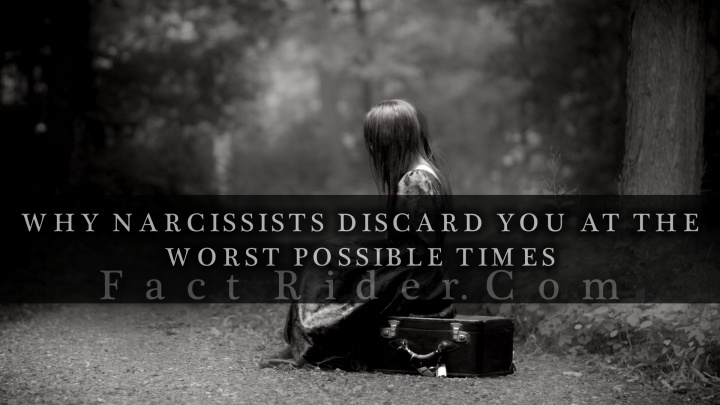 Many “discards” involve the sudden appearance of a new person in the narcissist’s life. In truth, the majority of discards are actually a sneaky implementation of the triangulation phase, where they begin comparing you with their new “love interest” and making you feel like you fell from grace because of your insecurities, nagging, declining appearance, exhaustion, etc. And if you agree to remain friends with the narcissist, you’ll get to hear all about how great the new person is and, eventually, the narcissist will go so far as to share the relationship problems they’re having with the new person with you! This is when you start believing the relationship didn’t work out because of you and things you’ve done (or didn’t do). In truth, the narcissist fabricated every single emotion and event that has resulted in this outcome. It was their intention from the very start. Sometimes though, the narcissist has a new person in their lives, but they strive to keep it under wraps. It depends on their social status among their inner circle, their business colleagues, and personal friends. They have an image to maintain, after all. In this scenario, the narcissist breaks up with you several times and disappears during weekends or for whole weeks at the time, claiming that they need time to breathe and reflect so they can get a clear picture of their feelings for you and the relationship. What’s really happening is they have another person lined up – and they are love bombing that person with such intensity, they can’t be bothered with damage control when it comes to the relationship they have with you. Therefore, they make it appear as if they need “alone time”, “time to breathe”, and/or “time to ponder things through”. Regardless of which scenario they execute, each has the same goal – to reawaken your primitive fears of abandonment and bring them to the fore. The narcissist “discards” you – often repeatedly – during important times in your life for a specific purpose, and it boils down to the basics of trauma bonding. You know you’re trauma bonded when you comprehend on a logical level that you need to leave the narcissist, but can’t seem to go through with it. Your friends and family don’t understand why you stay with someone who treats you so poorly. What they can’t relate to is that your abandonment triggers have been reactivated over and over again, which happens when we experience a break in an important bond with someone we’re emotionally attached to. Each time the narcissist triangulates or abandons you for days or weeks, it unleashes a new round of intense insecurity. You want to be reassured and loved by the very person who keeps betraying and abandoning you. A researcher who studied imprinting in ducks noticed that when he accidentally stepped on the feet of a duckling that was imprinted on him, the duckling followed him more closely than ever. Researchers investigated this phenomenon and it turns out that pain, whether emotional or physical, causes the body to release endogenous opiates that create a tenacious type of addiction to an object known as a traumatic bond. Narcissists discard their primary supply sources during the worst possible times to triangulate and form trauma bonds with their victims, ensuring they never forget the narcissist or the relationship. All other narcissistic manipulations aside, these two devastating tactics alone are enough to instill PTSD and a myriad of other psychological injuries. Some victims are misdiagnosed as having Bipolar disorder when they are actually experiencing symptoms of repeated abandonment trauma. Though it feels like everything has been ripped away, what’s happening is that your primal and true self is crying out, much like an infant crying for its mother. Triangulation and repeated abandonment carried out by the narcissist strengthens insecure attachments, guaranteeing you will feel jealous, needy, and worried all the time, perpetually seeking reassurance and validation from the narcissist – the very person who will never give you either of those things. It may feel as though you can’t survive this, but you can begin your recovery by planning out your No Contact strategy and exit plan. Stop trying to have a heart-to-heart with your abuser in order to get them to understand your point of view or discuss the ever-elusive resolutions to your relationship problems. Narcissists don’t want to solve problems because that’s how they keep you hooked. Plan out No Contact, find another person you can cling to during the initial stages of your recovery, and practice mindfulness to keep yourself in the moment instead of ruminating on the past or worrying about the future. It will feel impossible to do in the beginning. In fact, it will feel unnatural, but with daily practice you can heal from the trauma bond that the narcissist manufactured between the two of you. But you missed the main point. Yes, they do it to manipulate you, but it has to do with ENERGY. They are energy vampires that need your negative energy to survive-to EXIST! That is why everything is about making your life miserable because the more miserable you are, the more negative energy they receive. They are an addict and their "fix" is your misery, your unhappy, negative, feelings. Few are strong enough to break that bond. I lived through this, your words are so true. Wish I had a clue about this when I was surfing through this hell.